How long until public health becomes a priority? The Assembly will take up the second pilot program related to air pollution Thursday, April 11. 2013-35, Enhanced Solid Fuel Change Out Program, $650,000. Targets three hot zones with reimbursements up to $10,000 plus $500 or $1,000 in cash for purchasers of a pellet stove or pellet boiler. 1) Eligibility is limited to wood and coal burners in priority areas. FNSB Air Quality has identified three hot zones: The Rectangle of Death in North Pole, Nordale Elementary/Hamilton Acres, and The Watershed School/Dale Road. See maps below. 2) No smoke victims with life threatening emphysema or atrial fibrillation need apply unless they also burn wood or coal. 3) Funding is not for home or school air filtration systems or bus tickets to safety, but to increase already generous payments, currently up to $3,000, to as much as $10,000 to incentivize wood and coal burners. Change-out payments in current code are the highest in the nation, if not the world. 4) Program participants may be reimbursed for purchase and installation of an oil burning boiler or furnace, but cash payments of $500 or $1,000 are for pellet stove and pellet boiler purchasers only, thus may not be used to offset heating oil expenses. 5) With a single exception, no state, federal, or local code limits installation of any coal stove, outdoor wood boiler, barrel stove, or other highly polluting solid-fuel heating device. The exception applies only within the City of Fairbanks: installation of hydronic heaters is prohibited after June 8, 2009. Everywhere else in the borough including in the PM 2.5 nonattainment area is an install-anything zone, lacking any restrictions on what types of devices may be installed. For just over $100 and an old drum, anyone can smoke out the neighborhood. Assembly member Michael Dukes installed a Harman TLC-2000 coal stove last fall in his home in the Rectangle of Death. No provision in the proposed ordinance prevents installation of the most noxious, poisonous-smoke-spewing boiler next to any school in the borough. Or next to your home or workplace. As long as it is outside the Fairbanks city limits, it’s allowed. Highly polluting waste oil burners can be installed anywhere, anytime. Who loses under 2013-35? Residents who want to participate in the change-out program but live outside priority hot zones. The $650,000 cost comes from previous state grants, likely EPA pass-thrus, that would otherwise be spent for the existing change-out program for which anyone (resident or business) in the PM 2.5 nonattainment area is eligible. The program will touch 2/3 fewer residents than the existing program because the higher payouts ($11,000 under 2013-35 vs $3,000 previous cap) will burn through available funds far more quickly. Who wins? The dealers of the devices. Retailers like The Woodway and manufacturers like Central Boiler. Plus, Superior Pellet Fuels, the local pellet manufacturer. Could it help? If it helps one child avoid an asthma attack, that’s vital for that child. But what will prevent program participants from taking the money and turning right around and installing a highly polluting device? Absolutely nothing. Is it fair and smart? Why don’t purchasers of an oil furnace receive cash payments just like purchasers of a pellet stove or pellet boiler? FNSB testing at Omni Lab in Portland found a 40 times higher 10 fold reduction over burning a fuel oil furnace, see runs 1 and 40 of Omni Lab draft Appendix A. The additional benefit of going with a cleaner oil-fired unit is that it won’t be shut down during a burn ban. Can it be sustained? With state oil tax cuts on the way and federal cutbacks from the sequester taking effect, funding sources for the change-out program are likely a thing of the past. A case could be made to immediately suspend the change-out program to preserve current funds to use after Prop 3 expires Oct. 2014 and the Borough can establish limits on installation of highly polluting devices. Then there’s no backsliding, or need to pay the same program recipients again and again. But will it pass? The Assembly will pass it just so it looks like they’re doing something to help. Any recusals this time? Assembly members with a solid fuel burning device in the hot zone neighborhoods should be required to recuse themselves. Assembly member Michael Dukes has a coal stove in his Rectangle of Death neighborhood. If Assembly member Van Lawrence in Hamilton Acres has a solid fuel burning device eligible under the enhanced change-out program proposal, he should be required to recuse himself as well. However, as the ordinance does not specify what areas are specifically targeted, there may be an attempt to let assembly members skate on recusals. 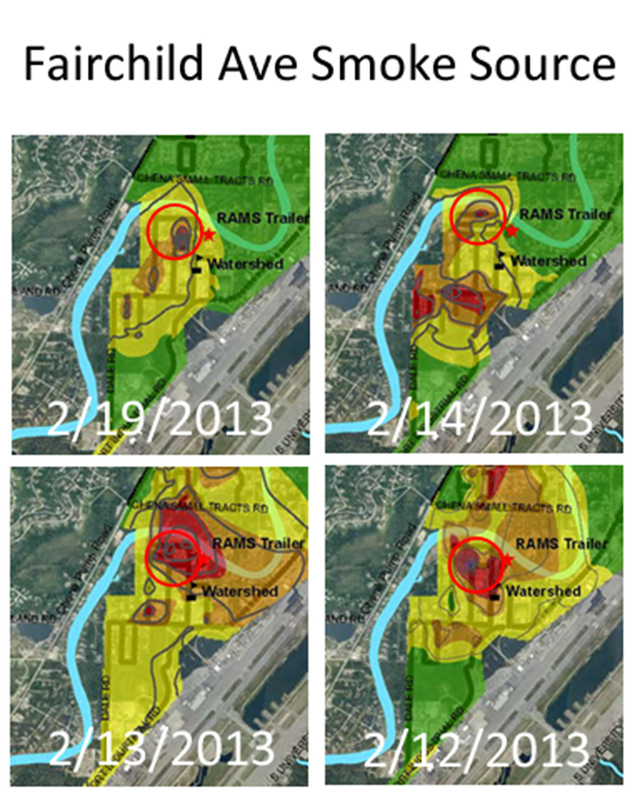 Assembly members were briefed on the “hotspots” during the FNSB powerPoint presentation on March 21, 2013, pages 5 and 6, so there’s really no question which neighborhoods benefit from the targeted payments. “People seriously were in a panic. It really became a question of heat or eat,” said Michael Dukes, a member of the Fairbanks North Star Borough Assembly who recently installed a coal stove — only slightly less polluting than a wood stove — in his home in North Pole’s rectangle of death. “I was paying twice what my mortgage was just to heat my home.” — Fairbanks area, trying to stay warm, chokes on wood stove pollution Wood-burning stoves give the Fairbanks, Alaska, area some of the worst winter air pollution in the country, 2/16/2013. When will polluters stop being rewarded? When will the pollution stop increasing? With consequences, instead of rewards, pollution levels will quickly decrease and public health will be protected. In the meantime, raising children is and will continue to be hazardous, especially in Assembly member Dukes’ neighborhood, the Rectangle of Death in North Pole. On Education and Incentives vs. Enforcement: All the education in the world won’t overcome the economic payoff that directly benefits those who choose to heat with highly polluting but very cheap methods. It’s a modern-day tragedy of the commons, forfeiting the air you need to breathe. Incentives for those who use highly polluting fuels may show progress in the short-term, but the costs of those incentives and the air quality improvements are borne by all. A few benefit directly. It’s only a matter of time before the public tires of throwing public funds at a special interest group. Enforcement, on the other hand, is self-supporting, sustainable, and deters pollution so harm is prevented. Only in Fairbanks, using the tail end of funds from a bygone era, can incentives be so generous and the effective, affordable method — enforcement — practically nonexistent. The Assembly will take up two pilot programs related to air pollution Thursday, March 28. Exclusively targets the Nordale neighborhood (Full Agenda Packet, p 103). Scheduled for public hearing at Apr 11, 2013 Assembly meeting. $1.15 million for air quality financial incentives and voluntary programs with zero fiscal impact to FNSB. Sounds good, but will it work? Might. People need help desperately. If it helps one individual breathe better air, that’s one life made better. These programs aren’t cheap. Willingness to spend $1.15 million more speaks to the concern that a realization is finally dawning: major economic stakes are riding on meeting federal PM 2.5 attainment as required by the Clean Air Act. Federal transportation funding and grants will be redirected to EPA to pay for the costs of meeting attainment if the state can’t show attainment has been met. Where is the $1.15 million from? It appears that it may be from pass-thru grants from EPA to the state, previously allocated to the Borough for stove change-outs. A little transparency on funding would be appreciated. Assuming the pilot programs work, will they be sustainable? Where would the cash come from for future incentives and infinite change-outs? After dark, how can the Borough “visually” verify incentive program participants who continue to burn? Full Agenda Packet, p 103. There is no restriction to prevent anyone, including change-out fund recipients, from installing yet another highly polluting device anywhere in the Borough. Directly across from Woodriver or Watershed or any school? No problem. Heck, a state-licensed daycare in North Pole has a noxious hydronic heater! It doesn’t take many wood or coal boilers or wet wood burners to erase hard-fought gains. For the record, these programs will not pay for installations of wood or coal boilers. Rep Tammie Wilson’s mission has been more wood and coal boilers with the $1.3 million earmark for her pet nonprofit without accountability, the Alaska Resource Agency and her bill to provide loans statewide that can be used to purchase and install more wood and coal boilers, HB 35. Their primary purpose is not improving public health, which they may, but to delay. To show EPA how hard we’re working here, thereby justifying an extension until 2019. Delaying nonattainment harms public health. The Borough says it is preparing a plan for attainment including: “identifying control measures and components that demonstrate attainment by December 2014,” 2013-29, line 18-21. Yet, 2014 attainment is calculated from a three-year average of design values from 2011, 2012, and 2013. The design value for 2011 was 38 and for 2012 was 50. Work the math. To reach an average of 35 to demonstrate attainment, the 2013 design value has to be 17 or less. How likely is that? We love snow, not getting snowed! Attention needs to be focused squarely on mandatory programs with effective, proven control measures and enforcement to protect public health. Focus not on delays, but on durable solutions. Be not distracted by delay tactics. The state legislature adjourns April 14. 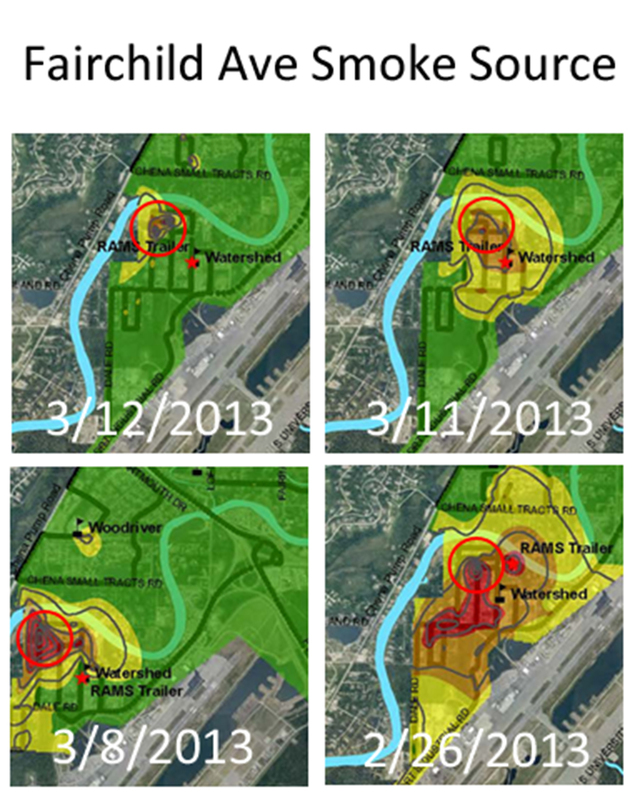 Distracting delays have nearly whiled away yet another session with this blog being the only voice calling for statutory citation authority for air pollution violations. 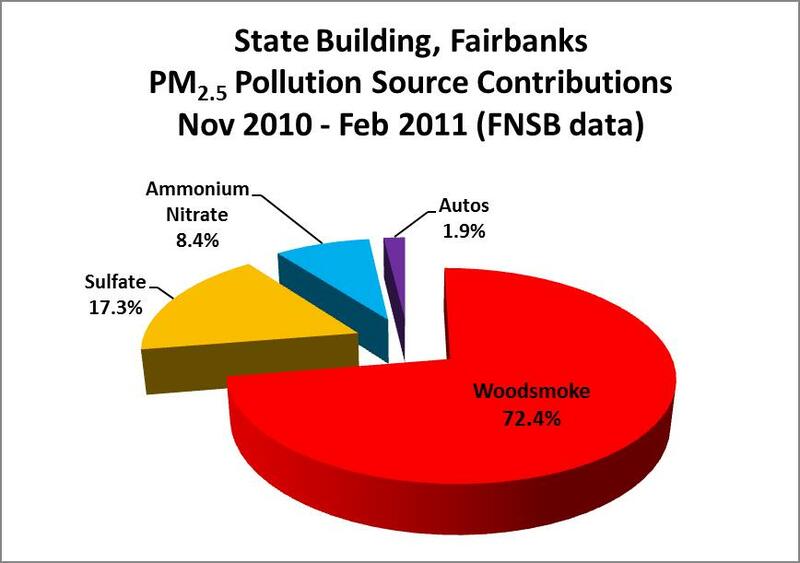 This void in the state’s paltry enforcement toolbox will delay PM 2.5 nonattainment indefinitely. New voluntary programs and incentives are not air quality controls. The ability to take pollution violators to court is not sufficient for effective enforcement. Delays backed up by public snow jobs are literally sickening. How much longer will public health wait to become the priority? Who’s Smoking out The Watershed School? WHO and WHAT has been smoking out The Watershed School? Concentrations on March 5 were higher at the Dale Road area charter school than at any other monitor in the Fairbanks North Star Borough or in the United States. The RAMS trailer monitor recorded UNHEALTHY with a 24-hour average of 63 µg/m3 and a peak of 113 µg/m3. 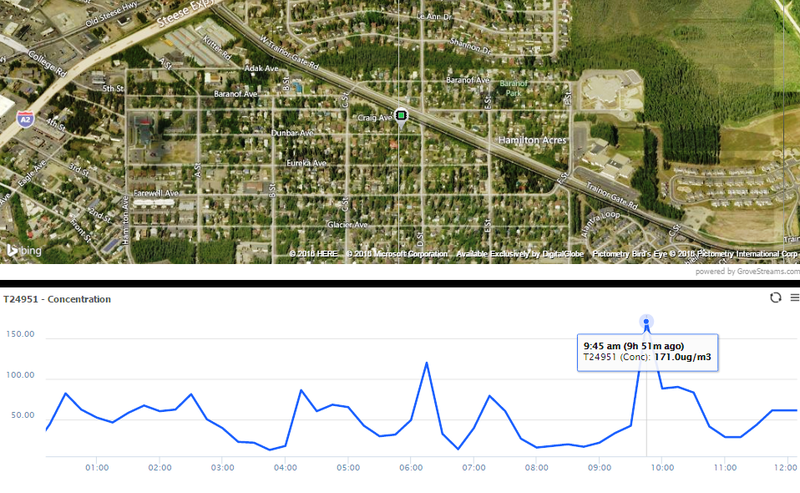 At 9 am, as children were being dropped off at school, PM 2.5 hit 98 µg/m3. 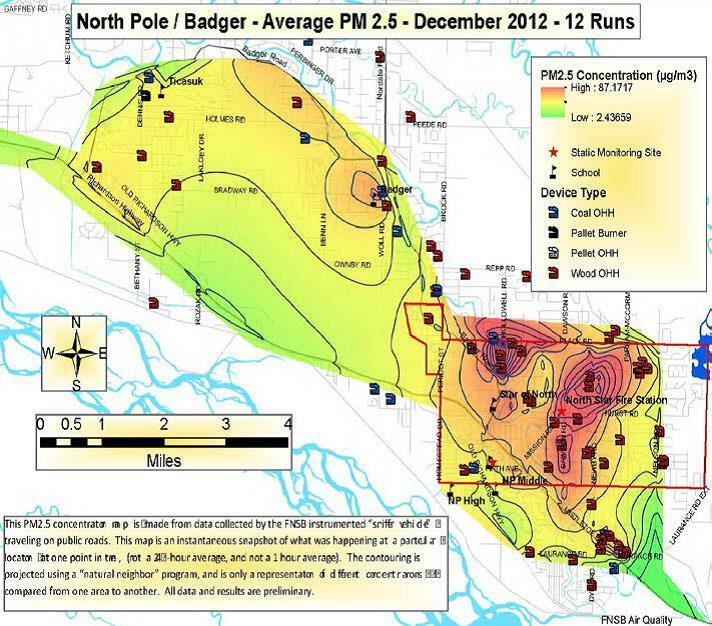 This poisonous air pollution was more than double that recorded in North Pole’s frequently toxic “Rectangle of Death” and nearly double the 35 µg/m3 federal 24-hr standard. Click and zoom in on the maps to take a close look at The Watershed School PM 2.5 pollution pit on March 5. 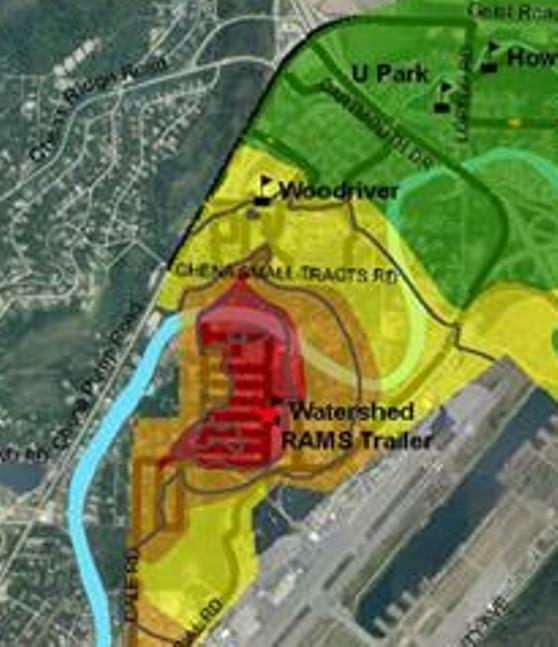 Note the two red, tell-tale funnel-shapes feeding into the UNHEALTHY air over Watershed and the nearby neighborhood. 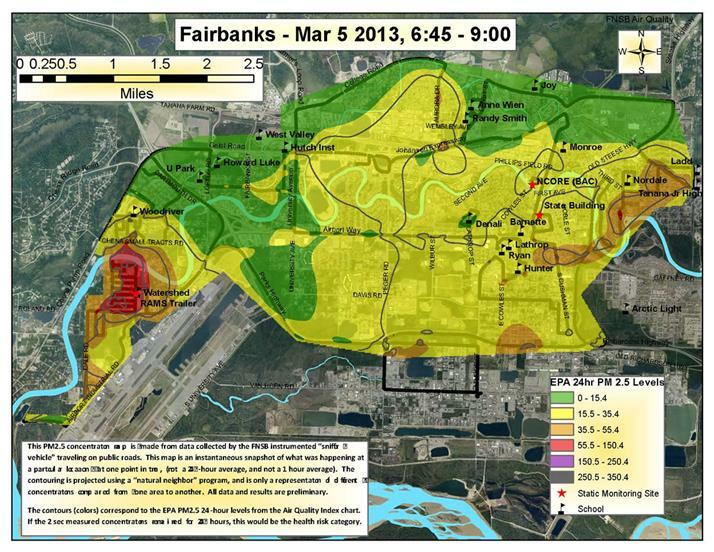 Virtually dead calm: at the Fairbanks International airport, zero wind was recorded at 9 am. So, Where’s the Smoke Pollution Coming From? With calm winds, wood and coal smoke accumulates near it’s source. 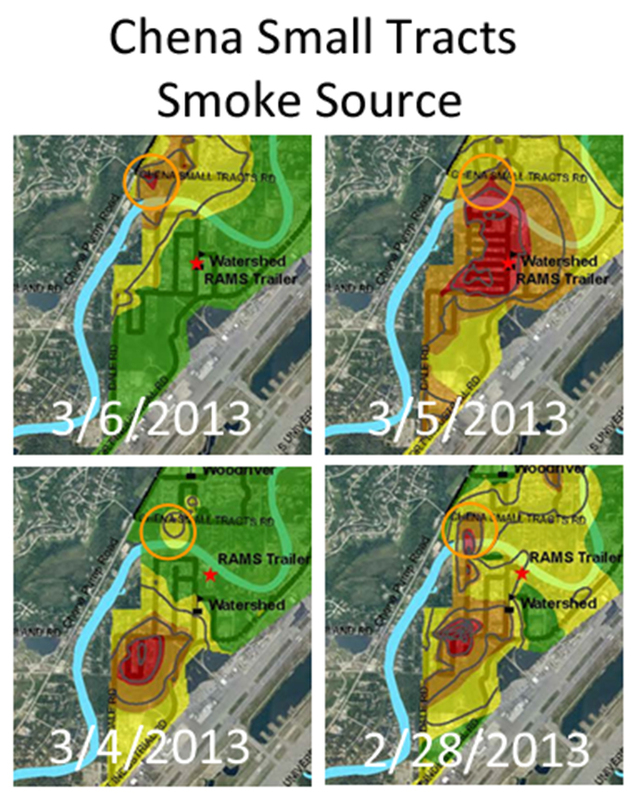 FNSB sniffer maps help identify smoke sources. 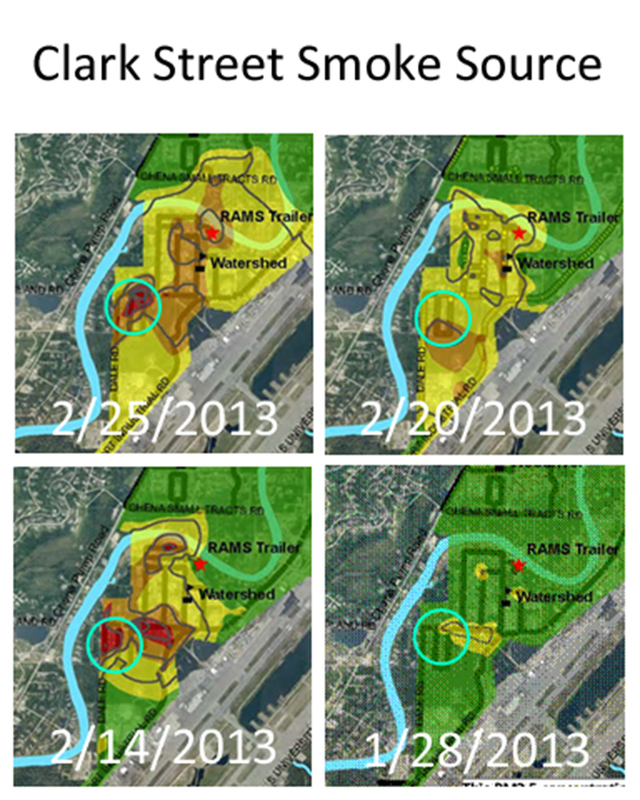 Near Watershed, maps appear to pinpoint three significant, repeated emission sources. DEC stopped the sources at Woodriver Elementary School. It’s time to fix Watershed. 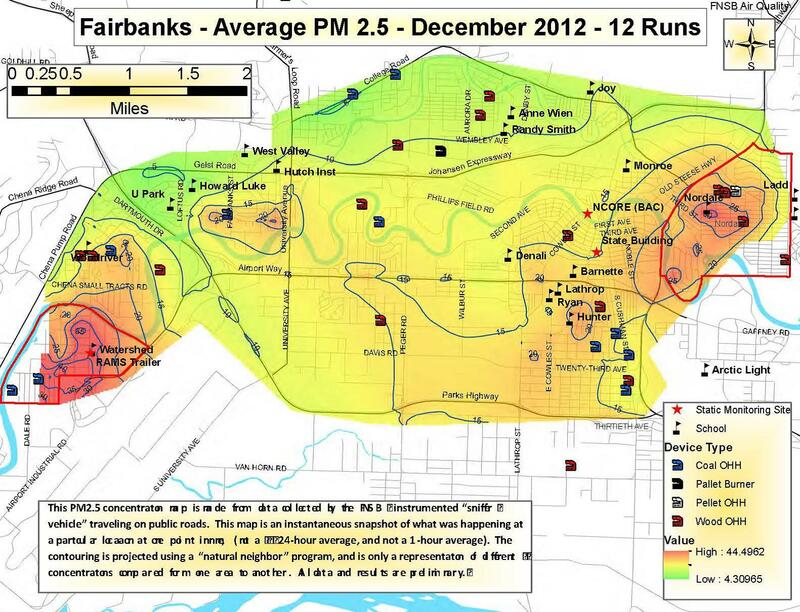 Thanks to the diligent (and at risk) sniffer vehicle drivers and the FNSB Air Quality program for publishing these maps. Definitely an UNHEALTHY trend in this recent Borough graph. Summer wildfire smoke is less of a problem than the worsening trend of winter smoke pollution. Winter air inversions cannot excuse delays that have led to permanently damaged hearts and lungs. Recent DEC intervention at Woodriver Elementary worked and serve as an example for future action. 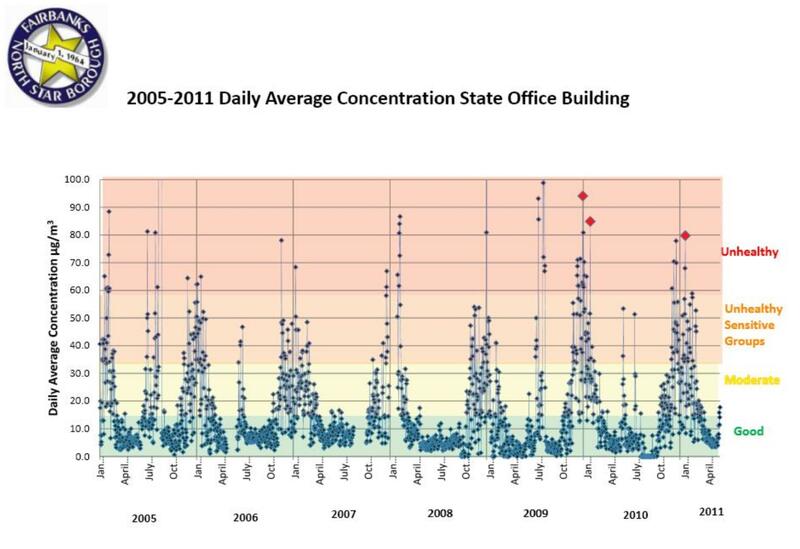 FNSB graph is from 1 in 3 day FRM monitor in downtown Fairbanks, the only one EPA considers [State Building, 675 7th Ave, Fairbanks, AK 99701] Monitors in other areas of Fairbanks and North Pole show more frequent exceedances and higher PM 2.5 pollution concentrations. 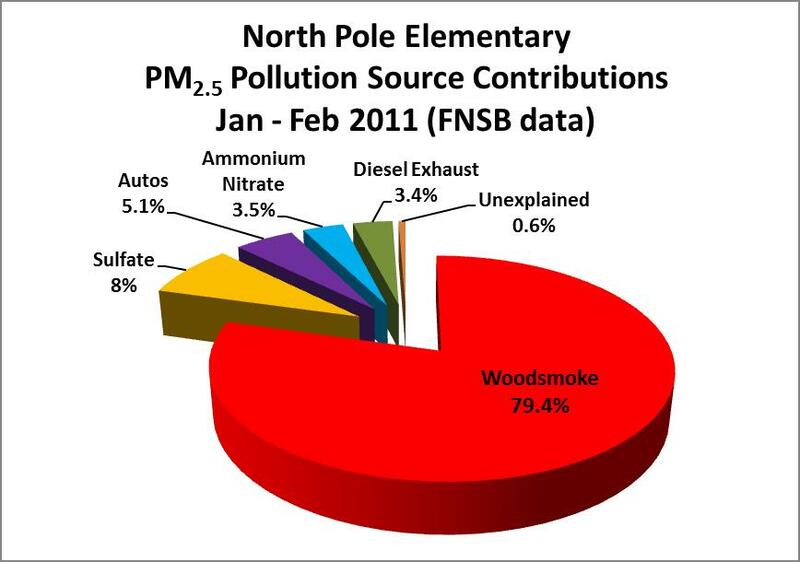 In a subsequent post, we’ll share recent data analysis on the sources of the winter smoke using Chemical Mass Balance.